Be the first to share your favorite memory, photo or story of Dwight. This memorial page is dedicated for family, friends and future generations to celebrate the life of their loved one. 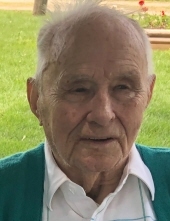 Dwight Orrin Willey, 91, of Riceville, IA passed away on Thursday, Jan 24, 2019 in Riceville, Iowa after a brief illness surrounded by his loving family. Dwight was born on February 11, 1927 in Livermore, Iowa to Clarence and Hazel (Peterson) Willey. Dwight graduated from high school at Lu Verne, Iowa and began farming with his family. Dwight entered the Army in May 1946 and served his country until October 1947. After leaving the military, he married Ruth Ardith Knuths on October 10, 1948 at the First Congregational Church at Rowan, Iowa. Dwight farmed in the Rowan, Iowa area until 1954, at which time he moved to Riceville and began farming along with a dairy operation. He also spent many years measuring government acres along with farming. Due to health issues, Dwight retired from active farming in 1968 and began selling Farm Bureau insurance. In 1972 he welcomed retirement and actively enjoyed life and traveling. After retirement, he and Ruth became snowbirds wintering in Florida, Texas, and for the last 20 years in Mesa, Arizona. Dwight was an active member of the First Congregational Church, United Church of Christ of Riceville, serving on many committees and holding several offices. He was also active in the 4-H serving as a co-leader, and as a member of the Howard County Council for several years. Dwight is survived by his loving wife Ruth, his children Cheryl (Bill) Williams of Houston, TX, Brian (Bonnie) Willey of Ankeny, IA, and Sharon McKinley of Rollingstone, MN; grandchildren Mandy (Paul) Espey, Ashleigh Williams, Joshua Williams, Katrina Williams, Michelle McKinley, Jacob Williams, and Cassie McKinley; and great grandchild Will Espey; and his sister Rosemary Newman of Albia, IA.Dwight was preceded in death by his parents, his brothers Ralph Willey and Floyd Willey, a sister Buelah Willey, and son-in-law Dan McKinley.Dwight’s many loves were farming and discussing crops or the lack of crops, wood working, playing cards, square dancing, and enjoying his kids, grandchildren, and great grandchild. Dwight would like everyone to know:It’s been a great journey. There have been ups and downs but I’ve had a great life. Want to thank everyone for enjoying the journey with me. In lieu of flowers memorial donations may be made to the Riceville Welcome Center 110 East Main St, Riceville, IA 50466 in memory of Dwight Willey. To send flowers or a remembrance gift to the family of Dwight Willey, please visit our Tribute Store. "Email Address" would like to share the life celebration of Dwight Willey. Click on the "link" to go to share a favorite memory or leave a condolence message for the family.